Mouse anti Human ETS2 OTI3E10. 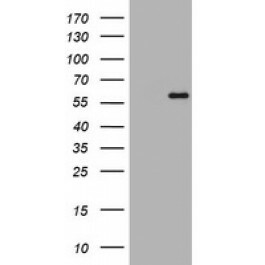 Human recombinant protein fragment corresponding to amino acids 90-349 of human ETS2(NP_005230) produced in E.coli. This gene encodes a transcription factor which regulates genes involved in development and apoptosis. The encoded protein is also a protooncogene and shown to be involved in regulation of telomerase. A pseudogene of this gene is located on the X chromosome. Altertive splicing results in multiple transcript variants. [provided by RefSeq, Jan 2012].